We arrived at the facility on Jan 24th and stayed until March 13th of 2019. As we expected, the unit was perfect for us. It had everything we needed and all we had to do was go grocery shopping. One of the guests told us about the local bus which leaves down the street and goes along a predetermined route to near all places that were interesting to us (Comer, Movie Theatre, Marina,beach ,Downtown and Walmart). It was very reasonable (13.5 pesos per person each way). Cabo's Little Secret is in a Mexican neighborhood and is very safe and the locals are very friendly. There are many hills (if you like hiking and we do) that you can climb to get great views of the Pacific Ocean and the Sea of Cortez. In fact the whales were visible from some of the hilltops. We loved the fact that you saw the same Mexican's, Canadians, and Americans climbing up to the weather station every morning. There are two small stores near by that you can buy essentials including beer and Liquor (no wine). There are numerous Mexican Restaurants close by and there is a shop that you can buy homemade cheese and also eggs at good prices. As far as the facility is concerned: The managers stay in Unit 1 and the rest 2 to 5 are for the use of the guests. There is a small pool that is not...We arrived at the facility on Jan 24th and stayed until March 13th of 2019. As we expected, the unit was perfect for us. It had everything we needed and all we had to do was go grocery shopping. One of the guests told us about the local bus which leaves down the street and goes along a predetermined route to near all places that were interesting to us (Comer, Movie Theatre, Marina,beach ,Downtown and Walmart). It was very reasonable (13.5 pesos per person each way). Cabo's Little Secret is in a Mexican neighborhood and is very safe and the locals are very friendly. There are many hills (if you like hiking and we do) that you can climb to get great views of the Pacific Ocean and the Sea of Cortez. In fact the whales were visible from some of the hilltops. We loved the fact that you saw the same Mexican's, Canadians, and Americans climbing up to the weather station every morning. There are two small stores near by that you can buy essentials including beer and Liquor (no wine). There are numerous Mexican Restaurants close by and there is a shop that you can buy homemade cheese and also eggs at good prices. As far as the facility is concerned: The managers stay in Unit 1 and the rest 2 to 5 are for the use of the guests. There is a small pool that is not heated, but enjoyable (if you are from Canada). We enjoyed using the Gas BBQ and the free use of the Washer and Dryer is a bonus. As explained, you have to clean the room and that includes washing the linen. Just like home. Thank you for the beautiful review Dave. You captured the feeling of our environment very well. We love having guests like you who enjoy exploring the neighborhood. It was an absolute pleasure hosting you. We wish you safe and enjoyable travels. Highlight of our trip to Baja! My friend and I spent 6 days at Cabo’s Little Secret as the final stop during our road trip around Baja California. Our choice couldn’t be better. Perfectly located at few minutes drive from CSL’s Marina, this condo has everything you need to enjoy a great time after a day spent exploring or chilling out on the beach. The rooftop, the pool, a cool barbecue (which we used extensively) and Arturo who is an incredible host (with the help of his two lovely dogs). Also our apartment was perfect, extremely clean and with all the amenities and appliances we needed. Definitely our choice for future trips back to CSL! Thank you so much for the wonderful review! It was an absolute pleasure having you stay with us. I look forward to seeing your name in my inbox again in the future. Here's to safe and enjoyable travels! We couldn't have asked for better guests. Thank you for the kind reviews and positive attitude. I look forward to seeing your name in my inbox again and again in the future. This place is great. It is an awesome value and it was exactly as described. If your looking for an authentic Cabo experience, look no further. Celeste is a great communicator and everything was exactly as described. We can't wait to go back. Many thanks to Ava and all of her wonderful local tips and ideas. Thank you to a fun and beautiful group of people. We thoroughly enjoyed having you stay with us at Cabo's Little Secret. And genuinely hope to see you again. We had the very good fortune of staying at Cabo's Little Secret for 14 days in early March 2018. 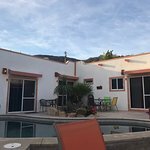 This adorable little property (5-2 bedroom units with full kitchens, free use oflaundry) has beautiful city views and sunsets, when not exploring Los Cabos, we relaxed in the gorgeous gated courtyard with pool,cactus garden and barbecue area. Celeste G. , the owner/concierge is very friendly and always helpful, she is a wealth of knowledge of the Los Cabos area. This immaculately clean property is the perfect quiet place to return to after beaching and exploring, a peaceful contrast to Cabo's frenetic pace. Cabo's Little Secret is eminently suited for longer stays. Cabo's Little Secret is a lucky find for travelers seeking comfortable digs, a peaceful, residential location close to the city center but out of the fray. You won't find a better host than Celeste. Yes, we would enthusiastically stay there again. Room tip: The units are all nice, uncluttered and simply but attractively decorated with a Mexican flair. Thank you thank you thank you for this for this incredibly thoughtful and loving review. Having your family stay with us at Cabo's Little Secret was nothing short of wonderful. You were some of our favorite kinds of guests. Travelers who delight in exploration of our magical peninsula as much as relaxing pool side while enjoying our facilities. We truly do look forward to seeing you again. Very nice two bedroom apartment in a quiet and safe location in Cabo San Lucas with a very attentive host. The value for money is great and the amenities super. We had a great base for our 5 day business trip to Cabo and would come again.